To the shock of many Indians the World Health Organization recently revealed in its Global Status report on Road Safety revealed that rather than anywhere else in the world, more number of people die in road accidents in India. The statistics are quiet shocking. A minimum of 13 people die every hour in road accidents in our country. 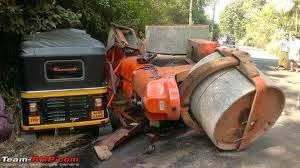 Among the states, Andhra Pradesh records the highest share of deaths because of road accidents (12%), and in the second place are, Maharashtra (11%) and UP (11%). This statistics should be enough for us to open our eyes regarding road safety. Because though there are many rules framed for our own safety we don’t follow them. Even in today’s time we find so many people driving two wheelers without helmet, and not following the traffic rules, especially students and the young ones. It is the responsibility of the family members to educate them regarding road safety. They should be thought the value of life and how so many people are dying on the roads because of one reason. Not wearing helmets, yes the majority of people who die in road accidents are the ones driving two wheelers, and in majority of the cases death occurs because of head injury and the reason behind it not wearing helmet. Especially when parents buy bikes for their children, they should think about the necessity first, if other means of transport are available for college such as public transport or college transport they should prefer that instead of giving them bikes. Young ones are full of energy and dare to take risk and face challenges, so they enjoy getting attention from people by making the bike run and performing stunts on it, instead of riding it. If at all parents want to give bike they should first educate their children regarding the necessity of wearing helmet, going at a safe speed, and how valuable the life is and how a small mistake can ruin it. Only when they are confident that the person knows everything about the road safety, traffic rules and has license, only then should they allow him to ride the bike, otherwise he is putting the life of the other person also in the risk. So, following traffic rules, knowing safety measures, servicing the bike regularly for any corrections or to make sure that it is in proper working condition, wearing helmet and caring and giving value to our own life and others as well, when all these things happen then the statistics of deaths because of road accidents would come down. So, drive safe and be safe.